Great healthy bread recipe. A great way to sneak in fruits and veggies. Happy Friday to you! Oh, man. I love zucchini bread. I love blueberry muffins. Why did I never think combine the two? GENIUS! :) I’ll have to put this on my (ever growing) to-make list. Thanks for the recipe! Yum! This looks so healthy. What an interesting recipe! I’ll definitely have to give it a try when blueberry season gets here. Looks wonderful! What a great recipe! And I love the idea of making bread muffins. It’s great for eating on the go. Some irony that I just made zucchini bread…but sadly without the blueberries. I’ll have to try this next time; sounds like a delicious twist…and thanks for including a link to my Coors Beer Bread! I think I might become obsessed with this bread. Looks AMAZING. LOVE this recipe! And I happen to have some gorgeous frozen blueberries at home and about a silo’s worth of whole wheat flour. I know what I’m doing this weekend!! This looks fabulous. Zucchini bread is not popular in New Zealand but I’m sure the blueberries will add to it’s appeal. Thanks! 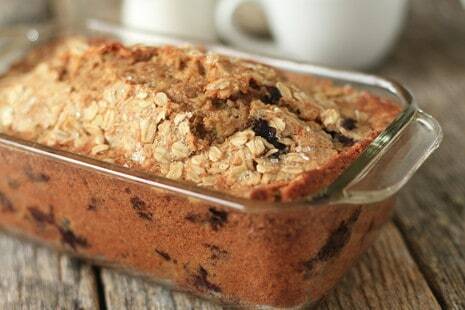 I absolutely love zucchini bread…adding blueberries is such a great idea! Love zucchini bread and Blueberries Holy Cow! I have been trying to get back to basics. Basic living, from scratch foods. This is going in the vault. PS hope your allergies are nicer to you tomorrow. I would never have put the two together, but I bet this is wonderful. The blueberries were so expensive today…hope that changes soon so that I can bake with them! Your recipes are never boring and they never dissapoint! Oops, submitted my comment too soon. How do you like baking in the glass dish compared to the metal one? Because I find they differ a bit in the way they bake and the glass dish is better for some things while the metal is more suitable for others. I absolutely love zucchini bread – or zucchini anything. The addition of berries looks delicious! I made a banana-zucchini bundt cake last year, this looks like something definitely worth making! Thanks for sharing =) the pictures are mouth-watering! Nothing says spring quite like brightly coloured vegetables and fruit in baking! What a great combination of flavors!!! Now I can’t wait to get that zucchini plant in the ground. This looks wonderful – and have never paired blueberry and zuke…. great combo! Quick breads are one of my top favorite baked goodies to make–so quick and so many flavor combo possibilities. I like the sound of yours–once the zuchinni gets in season, I plan on trying it! This bread sounds fabulous! Love the combination of zuccini and blueberries! I made this and it turned out great. I added pecans and some vital wheat gluten. Just the right amount of sweet. I just started my own blog and used my adapted version of your recipe as my first post, thank you! I just took this bread out of the oven, and had a little bite — holy yum! It’s so so good! I swapped in 1/4 cup ground flax seed for 1/4 cup all purpose flour, and added 1/4 cup brown sugar, and it’s just delightful. Thanks for a great recipe! Hi Jamie, I just made a double recipe this weekend and shared some at work today. The loaf got gobbled up so fast by co-workers, I was glad I made extra so I had some at home to eat later! Everyone loved how moist it was and how it wasn’t too sweet! Thanks for the great recipe! I love blueberries and just picked some this week fresh from the farm and have zuchinni from my garden. My bread came out of the oven not more than 25 minutes ago and I had to slice off a bit to try while it was still piping hot and it is YUMMY! I’m sure it will be even better once it has cooled a little more and the flavors have a chance to marry, but I couldn’t resist! Plan on making another loaf in the a.m. to take to a get together and I can guarantee that none will be left and they will want the recipe. Thanks!! Delicious! 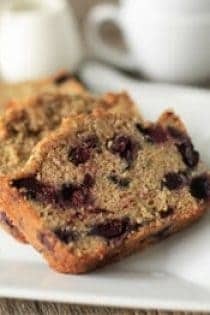 I find blueberry bread/muffins kind of boring but this had great flavor and texture. I actually think next time I may try and add more zucchini for a bit more savory taste. One change I made: I used whole rye flour instead of all-purpose flour to add a little more nutrition. Rye flour tends to add chewiness that whole wheat flour does not. This recipe was amazing. I tried it first in a loaf tin and found it a bit too dense and moist for my liking. The next batch I baked up I did as muffins which were fantastic. The extra amount crisp on the edges really contrasted nicely with the inner. This has gone on my summer must bake list, it is a real challenge to use up all those zuchinni and it makes for a great snack. Delicious! For the best cupcakes ever, decrease both white and brown sugars by 1/4 cup each and add 1/8 cup baking cocoa. My husband says they’re the best he’s ever tasted! Wonderful with a glass of port. Thanks for a great recipe! I made this bread the other day and loved it, perfect combination and not too sweet. YAY! I am so glad you like it!!! :) Have a great Sunday! I am going to make this right now! Boiron homeopathic alternatives to Benadryl…along with a Niel Med netti bottle available at all drugstores. If you are trying to be healthier with food, try some alternatives for the allergies, too! I live in Sacramento, CA and the allergies here are famously bad and these products work for my whole family!!! I am new to your website and I was searching for a good zucchini bread when I came across a link for your site. I have leftover wild blueberries that I froze along with frozen zucchini. This was a perfect mix for me! I made it this morning and it’s fantastic! I did throw in a few chocolate chips too to make it more of a dessert/snack bread (I’ve always had zucchini bread with chocolate chips in it). Thank you for sharing this recipe! My husband had stents put in his arteries and needed to change his diet. I have been looking for things better for him. I am NO cook, but thought I can follow directions, why not bake………the muffins are in the oven, as we speak, I’ll let you know! Stumbled upon your sight while I was searching for a recipe for some of the 20 lbs of blueberries I just picked. This recipe is awesome!! I love sneaking a little zucchini into a recipe and this came out perfect. I did use yogurt to replace some of the oil and added some nuts. The first loaf disappeared in a day and a half. I baked two more tonight–one for work and one for a friend. YUMMY!! I’ve got this in the oven right now. Cannot wait to eat some! Will the cooking time change if I do mini-loaves of this? I’m wanting to do mini-loaves as favors for our reception and this recipe seems like a really good one that my more health-conscious guests would love. 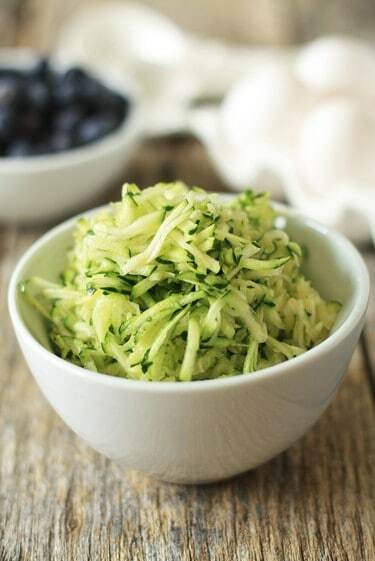 We have made this several times when the blueberries & zucchini are in season! My family LOVES it SO incredibly much! I wish I could figure out a way to pin it on Pinterest! Thanks SO much! These are absolutely something special. Stumbled upon your site looking for something to do with all the blueberries I had. I just happened to have a zucchini in the fridge, and I also happen to LOVE zucchini bread. What a brilliant combo! I did make a few changes: I used whole wheat pastry flour and then combined 1/2c oats and 1/2c wheat germ in the food processor and ground it into a flour. I also baked these in 12 muffin tins, topped them with a sprinkle of whole oats and sugar as you had for texture. Delish! I will however cut the sugar down next time, especially if I plan to top them in sugar — they are just a tad too sweet for me. Thanks for the brilliant recipe, a keeper for sure. Now I’m going to explore the rest of your site for more yummy things to make! Just made this! Substituted applesauce for the oil, added 1/4 c. white sugar, 1/4 c. brown sugar and about 1/4 c. honey. My bread came out a little dense, but very moist! Yum! Great recipe! Everyone loved it. I used frozen blueberries and it turned out great. This is fabulous! I made this as muffins the other day, and what a success! Since I need to be gluten free, I had to make some adaptations, and just because I love coconut oil, and coconut sugar, I used those. and for good measure I threw in a handful of walnuts. You would not believe how a family can turn into little piglets in no time flat! These were gone before I could even take a picture! This blueberry zucchini bread recipe has made it to my go-to list of recipes. The bread is moist and delicious. Thanks for yet another delicious recipe!! I am so glad to hear that you enjoyed the bread – thanks so much for coming back to leave your feedback on the recipe. Have a great day! We have 11 blueberry bushes and I’m always looking for new recipes to use them in. We have a huge garden every year and zucchinis are usually a bumper crop… So….. This bread is perfect! Thank you!! Your garden sounds amazing! Thank you so much for following MBA and have a wonderful day!